My day started out about 6 and pretty lucky. I got in the boat, backed out a little, and before beginning the tough task of getting the motor started (it's one of those little motors that starts up like a lawn mower with the choke and pull string thing), I tossed my first cast towards where I noticed a weed bed and immediately boated a nice smallmouth. But then I couldn't get the motor started, so I decided to row, stopping every once in awhile to throw a giant lure at the shore and not catch a musky. Did that for about an hour, then went around a point to the lucky cove where I almost caught the musky years ago. So, I'm rowing, once I get a little bit into the cove I'll be out of the wind and I can cast again. The way the boat's set up, you row facing the front of the boat - looking ahead. So I'm looking ahead and there at the end of the cove, walking along the shoreline, is a bear. It's pretty far away, and I can't tell if it's big or small, but you know... a bear! Before that moment, I'd lived my life hoping to never see a bear in the same space as me. No offense to bears, but that's my deal. The bear is that little tiny black speck going left to right on the "beach", and after I shut down the camera he walked into the woods there. The breathing you hear is me after rowing for 15 minutes - remember I'm the fat guy from Chicago. That's right, I forgot the motor doesn't work. I paddle out into the middle of the cove and try to start it again. I watch where the bear went into the woods for awhile, and then decide to just mosey a little closer and begin the musky quest again. It is truly a gorgeous morning, and if I'm gonna catch this musky, this would be a perfect morning to do it. I cast a couple times. Nothing, but I'm getting into that corner, my own personal magical corner where I hooked up with Mr. Musky last time. And each time I cast a little further up the shore. But once in awhile, I'll cast back behind the boat just in case I missed him. So I do, and right when my lure is in mid flight, I see the bear walk out onto the same shore I'm throwing at, about 100 feet away, and these things flash through my mind all at once: 1) CAN BEARS SWIM? 2) REEL IN THE LURE AS FAST AS YOU CAN 3) HE'S SMALL, BUT HIS MOUTH IS OPEN AND I CAN SEE HIS TEETH 4) MOTHER OF GOD, THE MOTOR WON'T START and 5) I... KNOW THAT BEAR FROM SOMEWHERE. I begin to yank that cord so my arm looks like The Roadrunner's legs in a Looney Tunes cartoon - like about 25 times in a minute. Suddenly, whatever the mechanism inside that pulls the chord back won't pull the chord back, and I'm just holding a limp chord and looking at a bear looking at me. Then, I made a noise. Not a man-scream, not a girlie scream, but there was definite fear in it. And the bear ran away. I rowed as fast as I could back to the cabin, took maybe 45 minutes. Kinda knocked the adrenaline out of my system, and I woke up the family and told the story. Emily goes, "What kind of bear was it?" I say I have no idea, but I saw his face. He was black, but his face was a lighter color. I know I've seen one before. And Emily says, "Duh, he's on your hat." 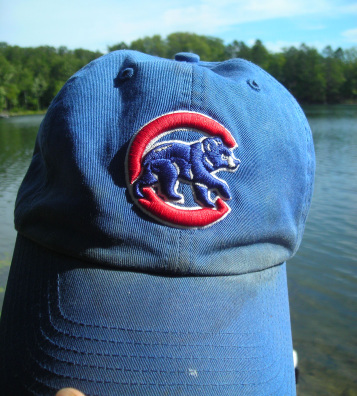 Even in the Great North Woods with your mind a million miles from the Cubs, they show up anyway. Man, this is a long post, sorry. I got to hear the good part of last night's game when AM 720 finally came on (it only works at night up here). It was 8-7 Pirates, and then the Cubs did that patented big inning thing and trashed 'em. Geovany Soto with the 7 RBIs. Gotta say, though, I'm a little more worried about Carlos. And... I just went to Cubs.com, and the next game is already starting. What I get for doing such a long post.